Last couple of months, it was very hard for me, I desperately wanted to start my blog, my little girl didn’t let me do anything. She is totally mama’s girl. She always wants someone around her to play with. She plays with us not with toys. I am feeling my childhood with her now. But, today is my day! I am not gonna talk about her. This cheese chili toast bread is my every week breakfast since she is started to eat solids. I generally avoid chili in her toast, but for us this is full bang on recipe, and doesn’t take too much time in kitchen. 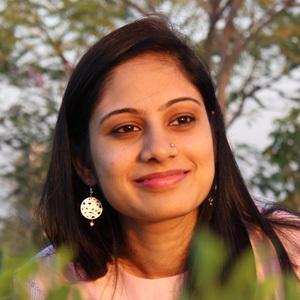 You can find another breakfast recipe Sabudana Khichdi Recipe which is also have high calories. And most important kids even like it most! 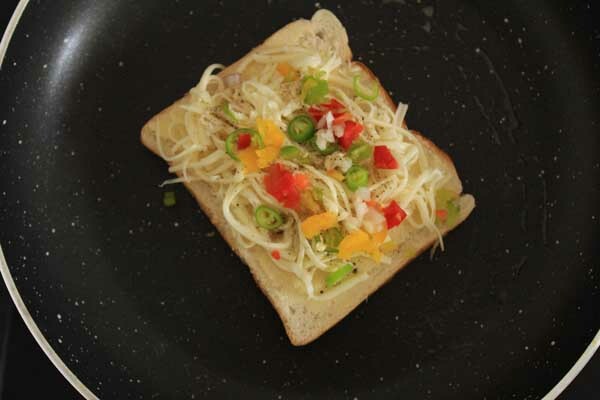 How to cook chili cheese toast? I generally cook these in oven, but early morning, I don’t have time to use oven or any other equipment. 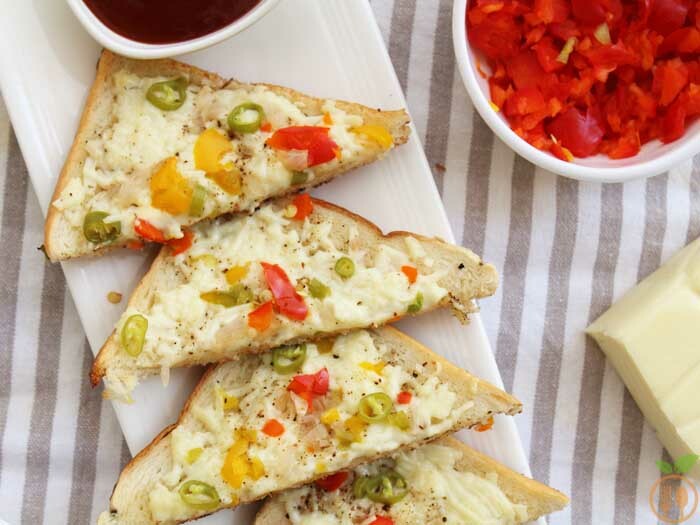 So I discover this cheese chili toast recipe on tawa or pan. 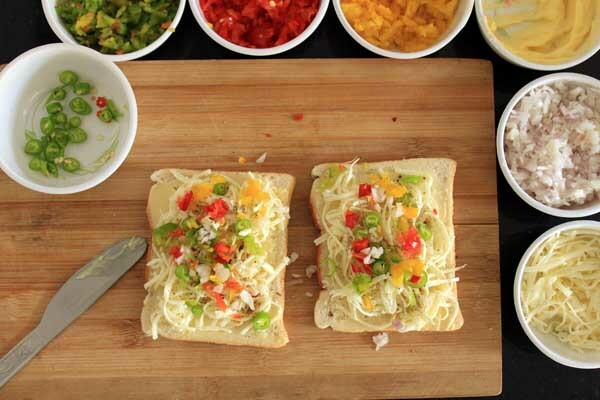 Honestly speaking, I have watched so many videos and recipes on the internet for get melted cheese chili toast on tawa. But I never get the result, which is shown their sites. Sometimes I burned the base to melt the cheese, sometime I got cold gooey cheese on top and raw vegetable as topping. You may find this recipe very common but it has some pressure point to get that same result as you get by making it into oven. 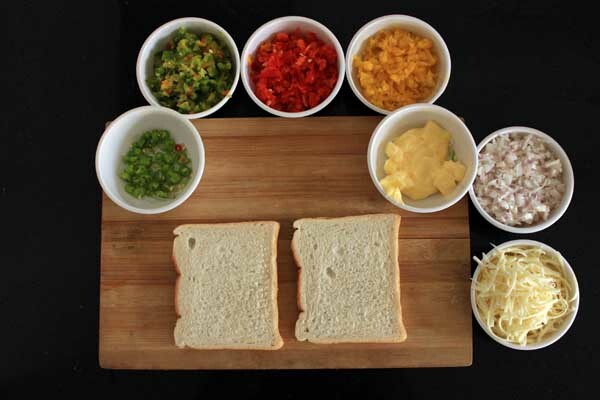 Let’s start chili cheese toast Indian style on tawa with step by step photos and some tips. First put tawa or heavy bottom pan into gas with lid on. and very law flame let it be hot. meanwhile chop all vegetables very finely. I have used three color bell peppers, onion. Corn will also tastes good in this recipe. Then add little garlic paste around 1 tsp into butter and mix it well. Then apply that butter on one side of bread. Now apply the cheese on bread. the amount of cheese will depend on you. then add pinch of salt. I preffer little pepper powder or chili flax. you can avoid them. Now apply very little amount of veggies. and green chilies. Now apply butter on hot tawa or pan, and immediately put that bread on tawa. let it cook for at least 5 minutes with lid on. Your toast is read to serve. 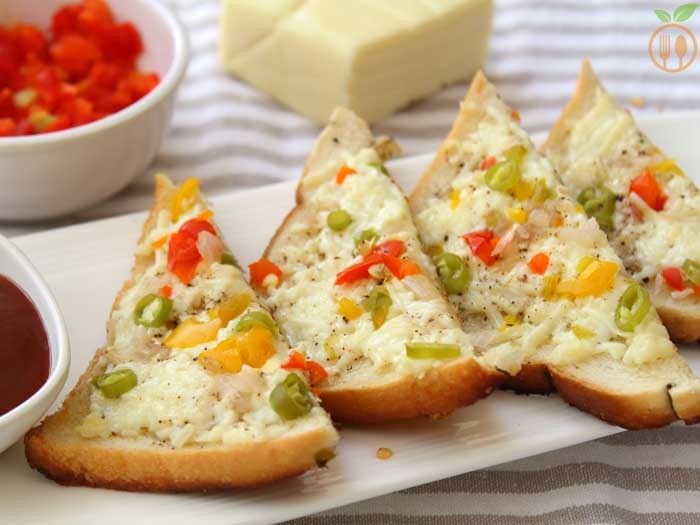 Use cheese with room temperature only, to get melted cheese on top of the toast. 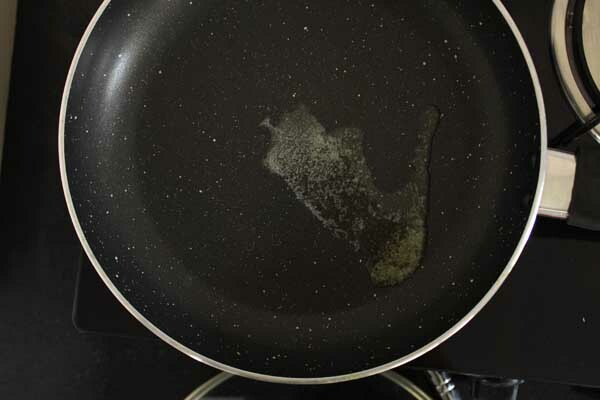 Use skillet with lid and heavy bottom, and first heat the pan into gas with lid on for 4-5 minutes on law flame. This will help to melt cheese on toast fast. 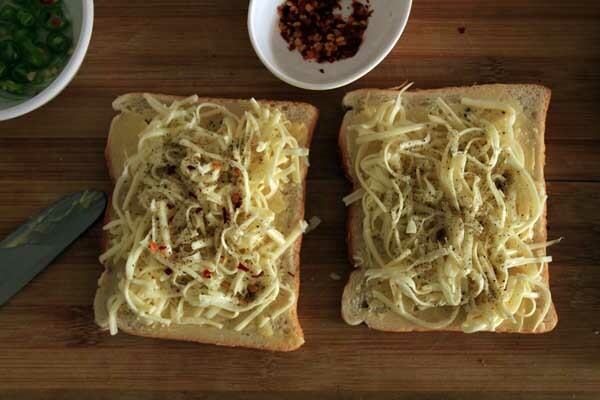 Grate cheese as fine as possible, large or thick grated cheese will not melt fast and your toast will burn from bottom. First take heavy bottom pan and put it on gas with slow flame for five minutes and cover with the lid. Meanwhile do the stuffing on the bread. 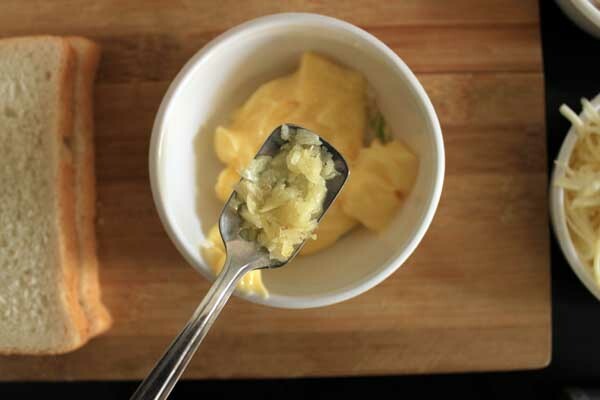 Start with adding minced garlic into butter and mix it well. 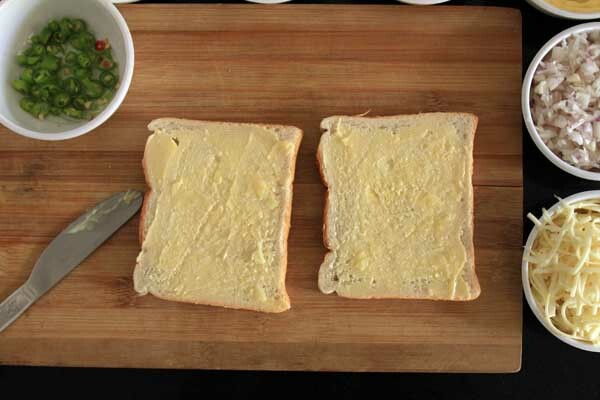 Then apply butter on one side of the bread slice. Now add cheese as per your taste. I have used processed cheese, but you can add cheddar or both as well. Now add pinch of salt, this totally optional. But I suggest use pepper powder; this will give super taste to veggies. Finally add green chili, again you can use adjust according to your taste of hotness. Then add all other veggies. I suggest use very little amount of them. Once pan is hot add half tbsp of butter, and put the toast into pan. now cover with lid and cook for at least 5-10 minutes on very slow flame, make sure toast may not burn. Once you find cheese is melting, your toast ready to serve. 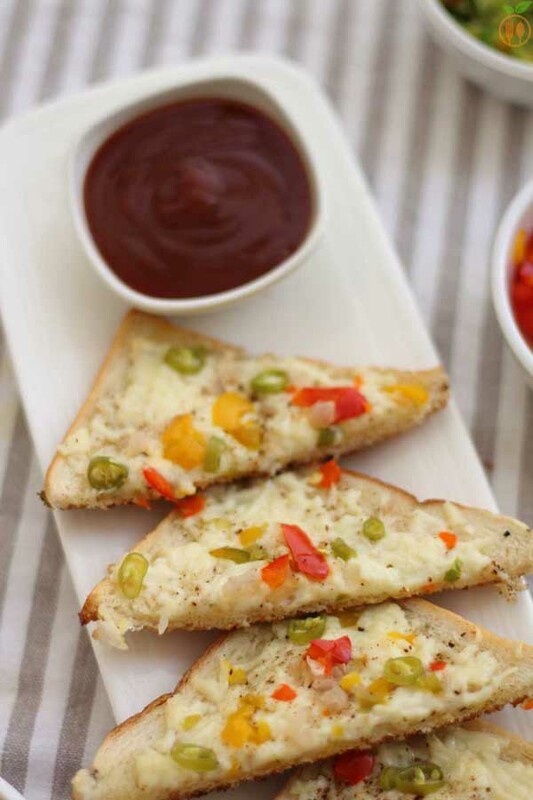 2) For any party food menu, these will be a very known and most adaptive appetizers for every ages of people.